I currently use three traditional cameras in my work: 1) 6x7cm medium format rangefinder Mamiya 7II, 2)Yashica Mat 124g twin lens reflex camera, and 3) Nikon FM2 single lens reflex camera. All three of these cameras use manual settings for shutter speed, aperture, and focus. In addition to these cameras, I use a variety of pinhole cameras. A pinhole camera, also called camera obscura, has no lens. Instead, light passes through a pin hole made in a very thin piece of metal, such as brass shim stock. As the light passes through the pinhole, an inverted image is projected onto a piece of film or light-sensitive photographic paper opposite the pinhole. The film is then processed by running it through a series of chemical and water baths to produce a negative image. The pinhole cameras I use are made from card board boxes and oatmeal boxes. The cameras' apertures are formed by poking a sewing needle through a piece of pie tin. A short strip of black electrical tape serves as the shutter. I use these cameras to capture images on pieces of photographic paper, which I later develop in the darkroom. This produces a paper negative. 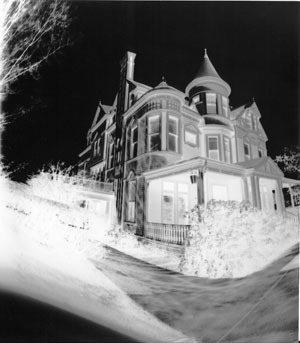 The paper negative can be used as the final print, or it can be converted into a positive image using a contact printing process, i.e., placing the paper negative face down on an undeveloped sheet of photographic paper and then passing light through the paper negative onto the photographic paper. Another pinhole camera I use is known as a Zero 2000. It's a teakwood pinhole camera handmade by Zero Image Company in Hong Kong. The Zero 2000 has a carefully calibrated pinhole and focal length. It uses a mechanical shutter and captures images on 120mm roll film in 6x4.5 cm, 6x7 cm, and 6x9 cm formats. While the designs of these various pinhole cameras differ considerably, they capture images with characteristics common to all pinhole cameras. These characteristics include soft focus, a Pictorialist quality, and an infinite depth of field. The different camera designs also create unique image qualities. The image plane in the oatmeal box curves inward towards the pinhole and creates abstract, dreamlike views of the world. The film plane in the Zero 2000 camera is flat and creates a more traditional looking, rectilinear picture. 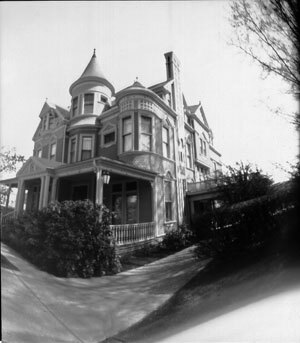 The oatmeal box camera creates a single, original negative print on photographic paper. The Zero 2000 camera creates negative images on roll film. Once the film is developed, the Zero 2000 negatives can be used to make an unlimited number of positive prints on photographic paper.